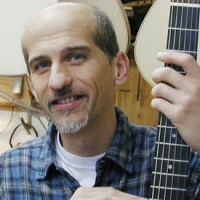 For more than 30 years, Stoll Guitars has been part of the German and international guitar market. Since the beginning, Christian Stoll has followed his own concept regarding body shape, bracing, overall appearance and sound, thus building a product line of classical guitars, steel string guitars and acoustic basses as well as offering custom instruments. Stoll is probably best known for the “Legendary Acoustic Bass” but also for innovative guitars like the “IQ” Steel string with fanned frets and “Double Fun”, a reversible steel string/classical guitar with two necks. A rewarding profession for 35 years. Wood is a living material and if you don’t get in touch with it and sense it’s potential, you will never achieve the optimal sound. That is why each of my guitars is a unique piece that, in the building process, receives the attention it deserves to become the best it can be. I will never get tired of this challenging work.